Do you know how you feel after eating a large meal when the sight of food—the very thought of food—becomes repellant? That’s how I started feeling about boat building in November. Let’s review 2010. Between March and October I spent nearly every free minute working on my Pocket Cruiser. In the process, I ignored important household repairs, watched weeds take over my garden, and—as the crowning touch–developed a serious and worrisome allergic reaction to marine epoxy. I coughed for weeks like a smoker with emphysema. Half of my wardrobe was spattered with glue or paint. When autumn arrived and I realized that my boat would not be ready to launch before cold weather hit, I suddenly shifted tactics and in less than a month built a plywood canoe, just so that I could say that I had finished something. Working against the clock, I painted the hull in near freezing temperatures and raced to a nearby lake with a couple of crudely built paddles, hours ahead of a cold snap. 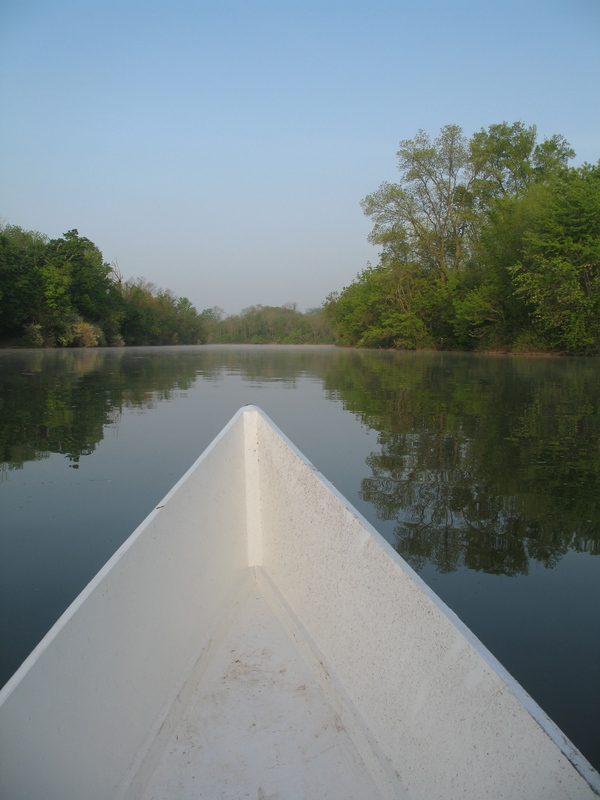 I paddled around the lake a maniac, barely noticing how spritely the canoe handled. 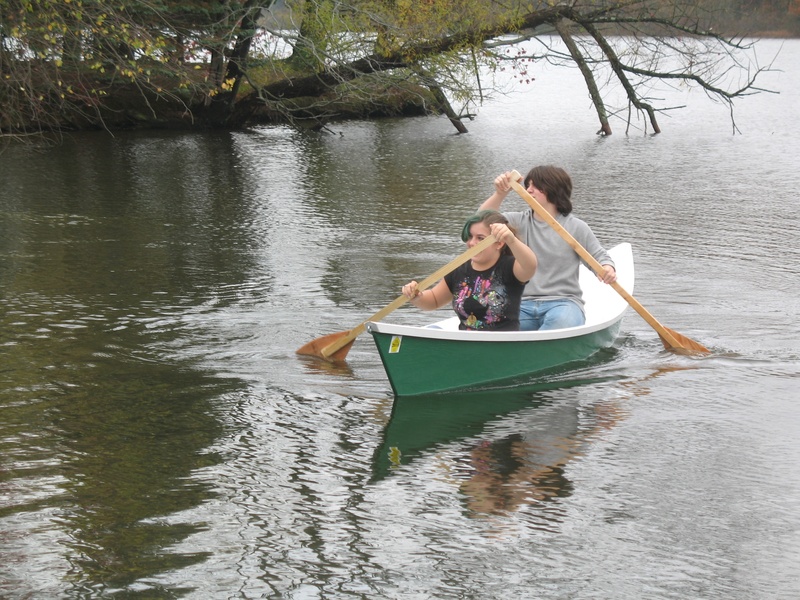 The canoe hit the water in late October. It was a beautiful day and my twins had a great time trying not to capsize. It moved gracefully and didn't have a single leak, but I was so frazzled that I hardly paused to celebrate. I am at last posting some pictures of the canoe on its launch day. The day was beautiful and the kids had a good time, but I was exhausted and the event felt like just another item to check off my to do list. I didn’t appreciate the beauty of the lake at the time. I had worked all summer like a man possessed, and not in a good way. The boat had become more than a hobby. It was no longer my mid-life therapy. And amid the frustrations and self imposed deadlines my enthusiasm waned and my original motivations seemed, at best, distant and unclear. Why did I every think it would be fun to sail down the Chesapeake? Why did I think it was important to fulfill this particular fantasy? Standing in a garage that looked like a woodworker’s war zone—wood scraps, debris, and disorganized boxes filled every corner—I really wanted it all to just go away. I closed the door on the garage and ignored my blog. And so December passed and the new year arrived. A Christmas snowstorm provided cover for my ennui. I couldn’t work on the boat even if I wanted to. But a few days ago temperatures climbed into the high 40’s. I wandered outside to refill the bird feeders and started sweeping out our basement. That made me feel better about life, so the next day, I decided to confront some of the chaos in the garage. Not all of it; just one corner. A few hours later I had cleared out piles of old lumber and other junk, sorting it all into neat “donate” and “throw away” piles. At first I ignored the boat. But as I swept the floor and created new vistas of open space, I finally paused to inspect the Pocket Cruiser. It still seemed dusty and forlorn; an unfinished homemade boat in a dirty garage can, under gloomy florescent lights on a grey winter day, look too much like a crudely assembled plywood box. But as my cleaning progressed, my mood improved, especially after the clouds parted and, for a few minutes, rays of sunlight streamed through the open doorway. For the first time in months, I walked around the boat and thought about what it would take to finish by spring. A bit of my old enthusiasm returned. So maybe I’ll finish the boat after all and maybe I’ll get around to buying a trailer and—who knows—I might even fulfill my original plan and sail down the Chesapeake. I’m hopeful. But in the meantime, I still need to finish cleaning the garage.